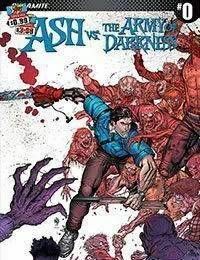 For 25 years, Ash Williams has been waging a war across time against the Army of Darkness. Now, Dynamite Entertainment is proud to present the next thrilling chapter, kicking off in this special 16-page prelude! Ash may be the Chosen One, but that doesn't mean he can hold down a steady job. But when he's scrambling for employment, will he find himself once again thrown into battle against the Deadites? Here's a hint: The book ain't called Ash: The Guy With A Regular Job Who Doesn't Battle Against The Forces of Evil. Don't miss out on the opening chapter of a new AOD epic from the red-hot writing team of Chad Bowers and Chris Sims and artist Mauro Vargas!